Home Jesus Illustrated Stories Jesus Is Warned To Flee From Herod. "Oh, Jerusalem, Jerusalem...!" Jesus Is Warned To Flee From Herod. "Oh, Jerusalem, Jerusalem...!" 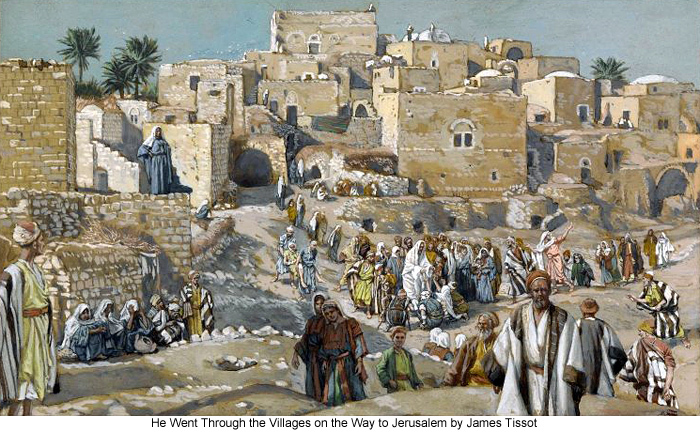 171:4.8 It was a confused and bewildered group of believers who this day followed Jesus into Jericho. The apostles could discern only the certain note of final triumph in Jesus' declarations regarding the kingdom; they just could not bring themselves to that place where they were willing to grasp the warnings of the impending setback. When Jesus spoke of "rising on the third day,"they seized upon this statement as signifying a sure triumph of the kingdom immediately following an unpleasant preliminary skirmish with the Jewish religious leaders. The "third day" was a common Jewish expression signifying "presently" or "soon thereafter." When Jesus spoke of "rising," they thought he referred to the "rising of the kingdom."